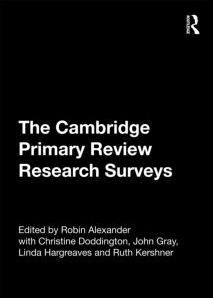 The Cambridge Primary Review Research Surveys, 850 pp, Routledge, October 2009. ISBN 978-0-415-54869-4 (hb only). Editors: Robin Alexander, with Christine Doddington, John Gray, Linda Hargreaves and Ruth Kershner. 66 contributing authors.